Thank you for your interest in "Korea's NATIONAL GUGAK CENTER: Masters & Masterpieces". This event tickets have been completely reserved and we are unfortunately unable to take more submissions. The National Gugak Center is a cultural arts institution　with over a thousand years of tradition and history since its beginnings as the Eumseongseo (the official music institute of the Silla Kingdom in the 7th century). They are the one and only Korean government-led music institution. Gugak, literally "Korean music," refers to Korean traditional music embodying the uniqueness and long standing customs of the Korean people. 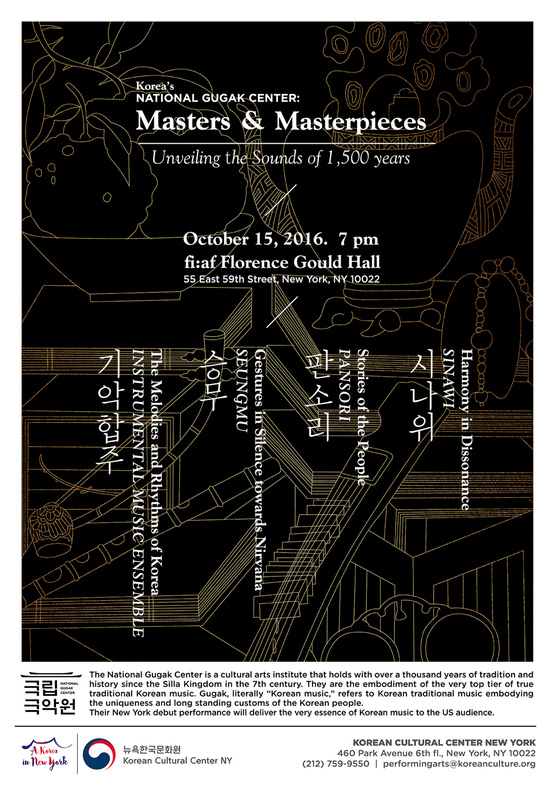 This New York debut performance of the National Gugak Center is especially important in that they are the embodiment of the very top tier of true traditional Korean music. With their premiere in NY, they are bringing the very essence of Korean music to the US audience. * Seats will be provided on a first come, first served basis. ** Due to limited venue capacity, RSVP for the performance is required by Wednesday, October 12, 2016 and RSVP confirmations will be provided on a first come, first served basis.